The BOA athlete summit, an event held once every four years for winter athletes, took place in Edinburgh over the weekend. A 5am alarm didn’t start me off in the best of moods, but I was cheered up on arrival in Edinburgh by the realisation of how Scottish a Scottish accent sounds (not like the diluted versions you hear on the BBC). And that everyone in Scotland, or Edinburgh at least, has one. It was a busy weekend, packed with various commitments such as press interviews, meetings/presentations about what to expect at the Games (if selected), and numerous inspirational videos about past performances and our hope of future success in PyeongChang. As I’m starting to knock on the door of 30 and have had experience at a Games, I’m begrudgingly becoming one of the more senior athletes in the group. And as such I didn’t expect to be so moved by the videos of Jenny Jones spinning in the skies like a sycamore seed on her way to bronze, or Lizzy Yarnold’s boyfriend (now husband) crying tears of joy as she swept away the competition for gold. I’m not embarrassed to admit that I was moved though, every snippet of Olympic action sent tingles down my spine and had the effect that the organisers had hoped (and knew) that it would have on all of the athletes in the room. The highlight of the trip for many though, was the Highland Games activity that we all took part in on the Saturday afternoon. Strangely enough the bobsledders were the most excited, and took the opportunity through the eight events to prove that there is no substitute for power for any challenge involving throwing/flipping/lobbing/tossing/pulling large heavy objects. Having never been to Edinburgh before I’d hoped to get into town to see some of the sights, and possibly some of the shows that were on for the Fringe Festival. It was not to be though, on the first night I collapsed into bed at around 9pm and fell asleep almost instantly without even time to curse the early morning. And on the second night I found myself starting my training session for that day at around 8pm after dinner, after which my legs were no more capable than a pair strawberry laces for anything but dangling off the end of my body in a limp and bedraggled manner. To me the summit was a successful weekend, and a rare opportunity to meet and mingle with athletes and support staff from all of the other winter sports, who become teammates for a fleeting few weeks only once every four years. 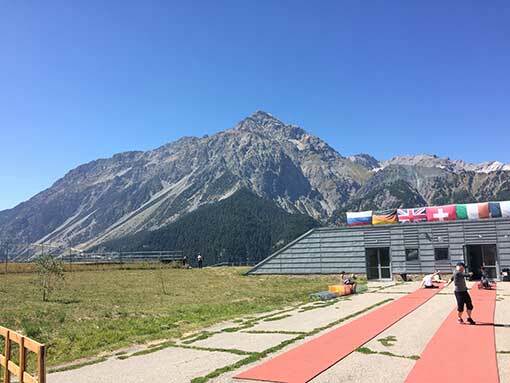 Two days, two flights and handful of delays later we had left rainy Scotland behind and arrived in the Alpine Italian sunshine for a push camp at the old Olympic facility for the 2006 Torino Games where Shelley Rudman won a brilliant silver medal. As a brief caveat before this I should describe our accommodation from this same trip that we made last year. We stayed in a small village called San Sicario down the hill from the Cesana push track, with a very rustic feel and some beautiful old stone buildings. Our hotel was in a corner of this village with views out over the valley below us that stretched for miles. The whole area had an air of blissful tranquility broken only by the quiet clucking of the chickens next door, or the gentle tinkling of the wind chimes that were hidden in the vines that climbed all over the walls of our building. The food that we were offered each day was split over three courses, finishing with a panna cotta for desert that I am convinced is the best panna cotta ever made! The first thing to hit us when we entered our hotel was the sheer number of pimpled pubescent Europeans. Thousands of them, all milling about with no apparent purpose like flies do in a confined space, bumping into walls and just generally getting in the way. Of course the first port of call was to find a toilet, which was conveniently signposted by a picture of a hat on the door and sign reading “Newspapers” next to it. After relieving myself from the effects of staying hydrated on travel day, I joined the team for dinner where the swarms of greasy euro-teens were sweeping through the canteen like noisy locusts. I found a quiet spot near the fruit table, which had a neatly arranged tower of kiwis, plums, apples and oranges on it that were entirely untouched — apparently invisible to our pimpled friends. I will not be lacking vitamins on this trip! After wading back out of the dinner hall we moved on to the delights of our rooms. They provide all that we need, in a matter-of-fact university hall style, and we even have a kitchenette and a balcony overlooking a field of raucous youths. The toilets have an interestingly narrow seat rim on them, I expect it gives a similar sensation to what you’d experience sitting on top of a novelty sized jam jar (with the lid removed). This gives the user a choice of either accepting the consequences of sitting with no blood supply to the lower limbs and hobbling away with a couple of severely dead legs, or to rush proceedings and jump off the seat hoping that your attempts at turbo-wiping have done a sufficient job. The main aim of this trip though, is to practise pushing a sled fast. And the indoor ice start house and surrounding abandoned Olympic track are the perfect setting for this.